Roger Smith was born in Patterson NJ in 1939. He passed away March 3, 2010 at the age of 71. He attended Cornell University, New York University, and the Art Students League, where he studied color with Hans Hoffman. He moved to Greenwich Village when he was 19. He was part of the Cedar Tavern Bar Scene of the late 50s. He did Action Painting in the Abstract Expressionsism movement. Smith had his first show at the International Gallery in the East 50s and his work sold out at his first showing. 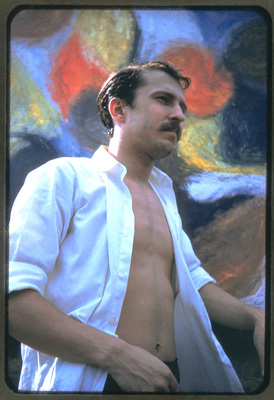 The artist also sold through the Koltnow Gallery at Sheridan Square in the West Village during the 60s. Roger Smith was married in 1961 and the next year, he and his wife packed up everything and moved to Rome, Italy for 1 year. The Mediterranean sun changed his palette which inspired him to explore a Vesuvian passion with colors on fire. Smith would paint during late night hours in his pied'a'terre For entertainment, in the evenings, the artist and his wife Joy would go to the cinema and for 16 cents they would watch Italian movies. They learned the Italian language in the process. Then the Smiths returned to the states in 1963, Roger worked at the prominent book publishers: Ridge Rutledge Co. and A.S. Barnes / Thomas Yosoloff, for several years, where he was a board man, as well as, a book designer and art director. Later Smith decided to pursue his painting career on a permanent basis. He found a Painting Studio on East 4th Street in the East Village where he produced an overflowing oeuvre of pen and inks, charcoals / pastels, acrylics, and oils from 1973 to 1991. At his untimely death, he had some very fertile and creative thoughts about work he wanted to pursue but unfortunately, we shall never see that work. But we are grateful for what he did leave as his legacy.